Wonderful experiences, touching peoples heart, learning & improving beyond your imagination, inspiring each other, laughing full of joy ... and singing together: Barbershop offers and means so much to me and has changed my life. It is my pleasure to give back to our barbershop family, by organizing the Harmony College, where we can experience and enjoy all of this together. I caught the barbershop bug 30 years ago, and ever since I have been incurably addicted – not only to these wonderful harmonies and overtones, but also to this truly special community and the feeling of belonging unique to barbershoppers. Through my involvement with BinG! and with the Harmony College team, especially, I would like to do my part to inspire even more people to sing with us, and to offer them the best opportunities for training by bringing in top-flight coaches and interesting coaches every year. Barbershop manages to bring together people from all kinds of backgrounds, to create a harmonious and positive atmosphere, and to immediately make everyone feel that they are part of a community. 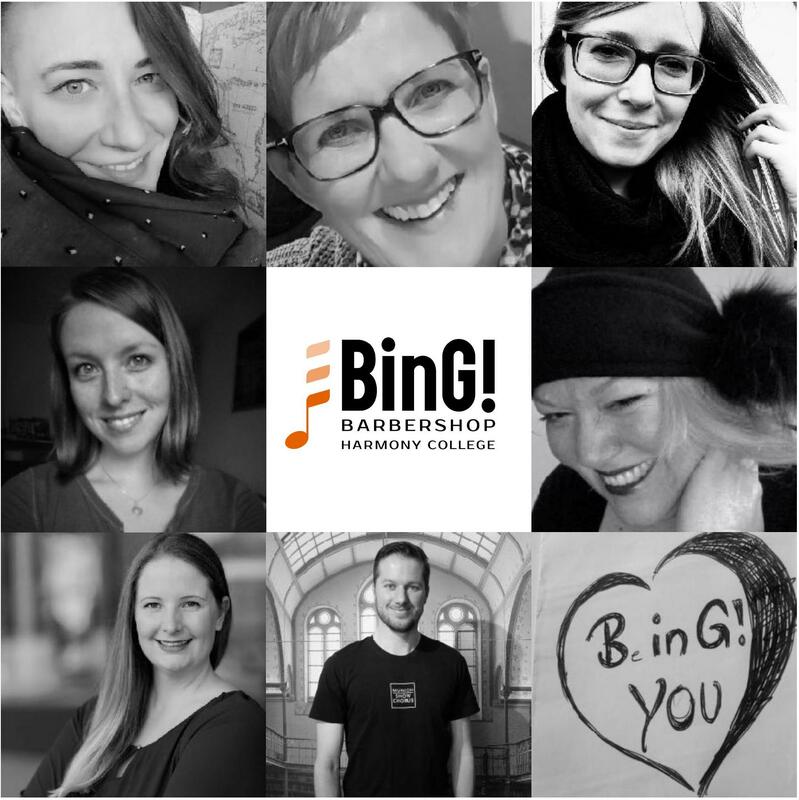 This community is especially great at BinG!, and it’s an unparalleled honor and joy to be part of this family. Does it always have to be barbershop? I love all kinds of music. Soft, loud, strident ... as long as it‘s GOOD! I joined the Harmony College team because I want to keep such events alive and growing. My task? Sorting, search, finding, and getting the singers everything they need. I help with registration where I can, and take care of the marvelous songs we will be singing in the choruses. Indeed ... but no – tormenting me will get you nowhere! I’m incorruptible! I won’t say a word! À bientôt pour chanter un “Tag”! I wouldn't want to miss the experience I had last year as a member of the Harmony College team. I have grown a lot and am happy to work with such great and creative people. The Harmony College is for me the heart and soul of our association and I am proud to be a part of the engine. After being the spotlight with Kavaliersdelikt for many years, it’s time for me me to see the other side of the Harmony College and to set up the stage for new and old starlets in the best possible way. For 14 years I have been singing with the Harmunichs, where I had my first contact with barbershop. Since then I’ve succumbed to barbershop fever: in addition to various quartets, I also joined the No Borders Show Chorus 4 years ago. About Barbershop I enjoy the most that it is an international community. At all of the many conventions and choruses I have visited, I have always received a warm welcome. Since I love to travel myself, it is my pleasure to take on the task of organizing the travel for our coaches.